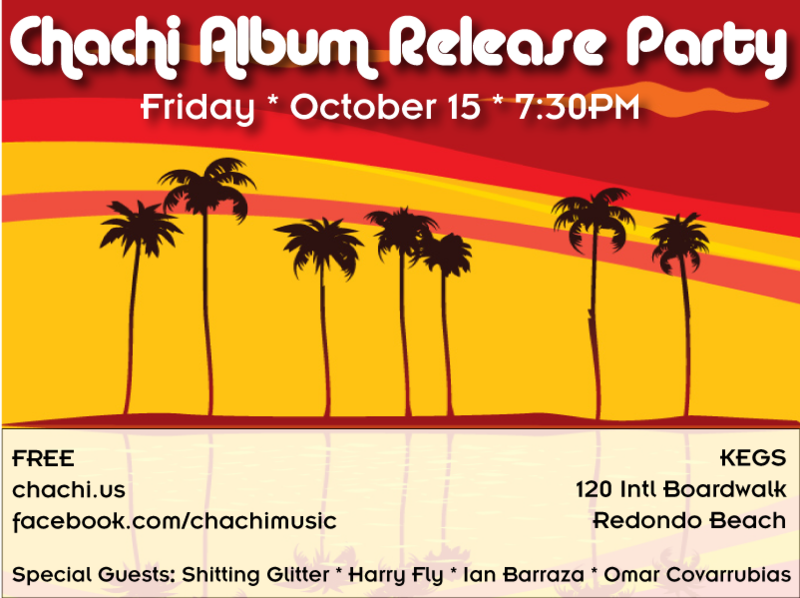 Chachi Album Release Party! | Chachi - The indiest band in the land: music, videos, concerts, photos, etc. « Thanks for partying with us at our release party! Chachi’s new album “Enjoy the View” is out and we’re throwing an Album Release Party at one of our favorite venues to celebrate. Come out to KEGS at the Redondo Beach boardwalk for a night of great music, drinks, and magic. Special performances by our friends Shitting Glitter, Harry Fly, Ian Barraza, and Omar Covarrubias. CDs will also be available for purchase. Come early and enjoy the seafood at the boardwalk or have pizza and beer at KEGS. Mark your calendars, this will truly be an unforgettable experience! Freebies for every CD sold at the party! while stock last! YA. I remember that show. Thanks for playing. We’ll try to get you back in this month.UM it’s september 2011.